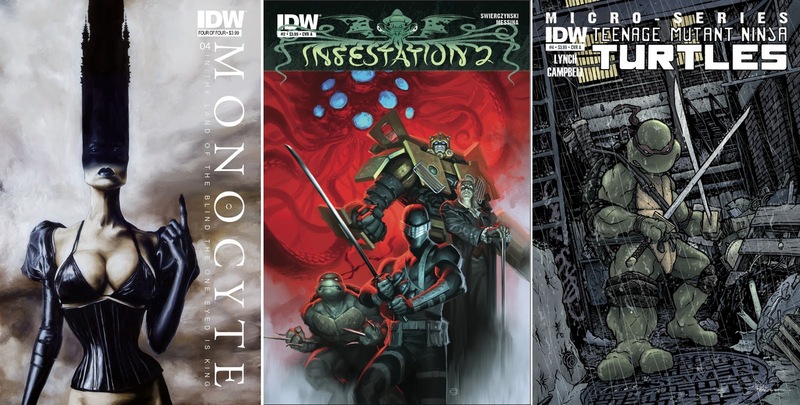 Infestation 2 is still running rampant in the universe (universes) of IDW Publishing, but with a new Popeye series launching, Turtles, Transformers and Cobra Terrorists, that's just part of the madness. Of their April range however, it's these four covers leading the insanity. 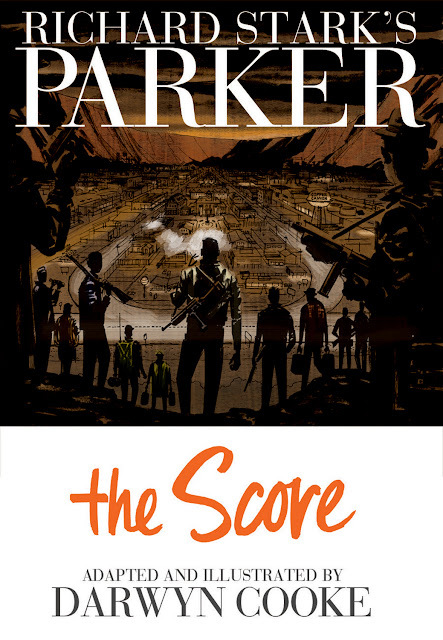 COVER OF THE MONTH: DARWYNE COOKE - RICHARD STARK'S PARKER: THE SCORE Ahh white space, what a difference you make to a cover. Doesn't matter that the non-white space is a moody ominous scene of a bunch of people descending on a small town drawn by one of the greatest illustrator's alive, it's the white space that counts. IDW says: Fresh from his efforts on The Hunter and The Outfit, Darwyn Cooke now sets his steely sights on The Score, the classic Richard Stark Parker novel from 1964. Parker becomes embroiled in a plot with a dozen partners in crime to pull off what might be the ultimate heist -- robbing an entire town. Everything was going fine for a while, and then things got bad. Considered one of the best in the Parker series, The Score is the perfect vehicle for Darwyn Cooke to pull out all the stops and let loose with a book that has all the impact of a brutal kick to the solar plexus! Written AND drawn by Darwyne Cooke. 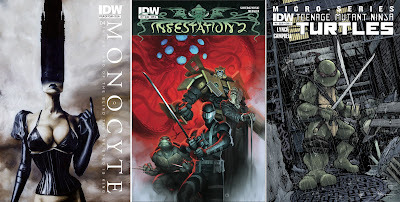 Phil Hale - Monocyte #4, Alex Garner - Infestation 2 #2, and David Petersen - TMNT Micro Series #4: Leonardo. For more April titles and info from IDW click here. Thanks IFF! Ive made a pact IM going to try more none big two books than ever before this year, and The Score might just be one of mine too.